Whirr-clunkers is a somewhat unkind name bestowed on campervans and motorcampers, usually by people who are woken in the middle of the night by owners opening and closing the sliding door as they dash to the tourist park’s loo. There are various schools of thought on sliding doors, fitted in particular to motorcampers. 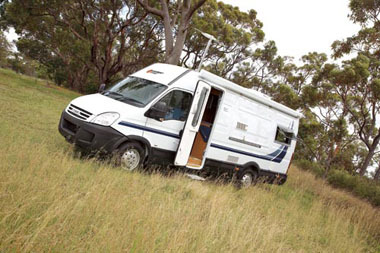 By way of explanation, motorcampers are converted from larger vans – Fiat Ducatos, Mercedes Benz Sprinters and Iveco Dailys, to name a few – and all come with a large nearside sliding door to expedite speedy commercial deliveries. Some travellers are happy to have the standard sliding door, but others who really like the size of the motorcamper would prefer to have something else. A few RV builders have developed a special panel that replaces the sliding door and forms a moulding which can accept a standard motorhome door. Sydney-based Suncamper, which builds a variety of campervans and motorhomes, has developed a normal door fitting for its Iveco Daily van conversion. It’s an interesting variation on its Sarina model and was developed in response to customer feedback. Suncamper has used the Iveco Daily 35S14 van for its conversion. It is 7.1m (23ft) long and powered by a 2.3L 100kW turbodiesel engine. Our Sarina came with Iveco’s six-speed AGile AMT gearbox. It also came with airbags for both cab seats and the Electronic Stability Program (ESP), which includes traction control. On the road, the Daily is very much the typical Euro van and a nice easy driver. Unlike its Italian stablemate, the Fiat Ducato, the Daily is a rear-wheel-drive van. Although the van has the smaller Iveco engine, the 100kW delivers the necessary power and torque and the Daily is no slouch on the road. In a minor revamp of the van, the sliding door has been removed and the aforementioned moulded panel fills the gap. It’s designed to accept the Dometic half-window door and fit the profile of the van. It’s a very good looking job that replicates the panel lines of the Iveco. For insulation purposes, the van roof has been lined with 30mm of foam and marine ply. More conventional items are the Seitz hopper windows, gas cylinder locker, Thetford toilet, roof-mounted air-conditioner, electric step, Winegard antenna and Fiamma awning. Inside the Sarina, one of the benefits of the revamped door arrangement is immediately obvious – the smaller door area provides more space for other things. A slight disadvantage of this setup, though, is that it makes the area feel more confined. 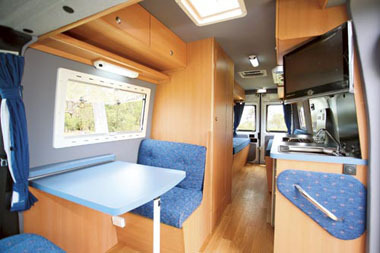 Suncamper has developed a layout with sideways-facing lounges in the rear, which can be used as single beds or made up into a double bed. A kitchen bench fills the rest of the nearside and a small bathroom is opposite. One of the design challenges in the Iveco is that although it has a flat floor and swivelling seats can be fitted, the pedestal-mounted handbrake on the left-hand side of the driver’s seat can restrict seat movement. 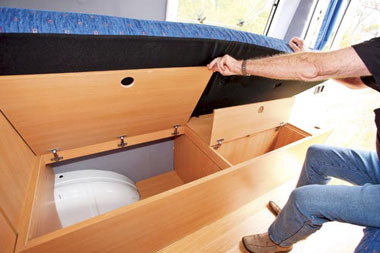 Suncamper has overcome this issue and both cab seats swivel around, with the driver’s seat making up part of the small dinette. Suncamper’s internal decor may appear slightly square, but it does have a purposeful look about it. 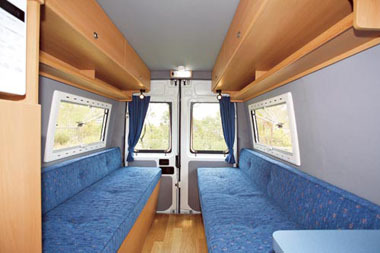 Curtains are fitted to the front cab and the rear doors, but the wall windows use the integrated blinds. Those familiar with this style of motorcamper will immediately recognise the flexible design. 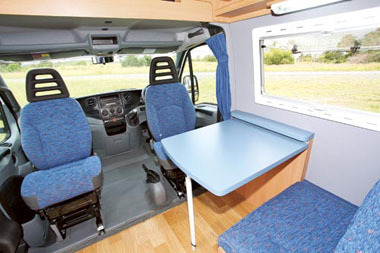 The small dinette at the front means that you can have the double bed permanently set up. There are the usual storage facilities in the rear – both lounges have underseat storage, although part of the storage is occupied by both the nearside water heater and the offside gas cylinder locker. Above, there are overhead lockers which are supplemented on both sides by a small shelf that can be used when not travelling. Lighting is supplied by a rear wall-mounted fluorescent and halogen reading lights on either side. Powerpoints are also fitted on either side, one beside the offside wardrobe and the other at the back of the kitchen bench. In motorcamper/motorhome design circles there’s a certain logic that says smaller motorcampers/motorhomes often have bigger kitchens than much larger motorhomes, despite the latter having considerably more internal space. One manufacturer’s theory on this was that people who had more expensive motorhomes could afford to eat out more often. True to form, the Sarina does have a relatively large kitchen bench – large enough to fit a two-burner cooktop and stainless steel sink. The latter does not have a drainer fitted, but there is certainly space for it. Under the cooktop is a Dometic RM2350 90L fridge and surrounding that are four cupboards and three drawers. That other kitchen essential, the microwave, sits mounted in the cabinet opposite with a wardrobe below and a small cupboard above. It’s at a user-friendly height. 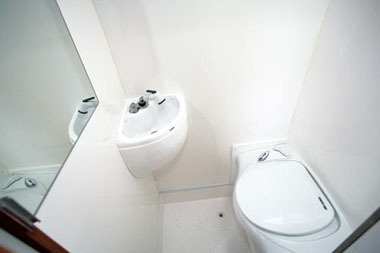 Sitting almost amidships in the Sarina is the compact bathroom. It comes with a flexible-hose shower rose that also supplies water to the corner basin, and a bench-style Thetford cassette toilet. Ventilation is from a fan hatch and lighting from a ceiling-mounted fluorescent lamp. As mentioned previously, both the driver’s cab seats swivel around, forming a small lounge/dining area with the rear seat. Overhead lockers with shelves sit above the table and the area above the driver’s cab is fitted out as an open shelf. It’s not hard to figure out why the standard door modification – seen in this Suncamper Sarina – is popular among RVers who prefer the motorcamper-style of travelling. You get most of the benefits of a larger motorhome (without a whirr-clunker door), and have a narrower and lower vehicle for navigating city streets and enjoying better fuel economy on the open road. The Iveco Daily’s length still gives plenty of interior space and room for the motorhoming luxuries generally considered essential for modern-day travellers.